Lucy backed out of her harness March 24th while at a family friend’s house in a gated community. There were sightings the first few days but people were chasing after her trying to catch her. She was running in fear from everyone between the gated community and a nearby trailer park, squeezing in and out of the wire fencing. Then the bad weather came. Rain, Rain and more rain. Lucy’s owner and a good friend, as well as some volunteers got together and flyered all around the last sighting areas. Intersection signs also went up. There was much concern with the cold and rain. A day or two went by without sightings. Then another sighting but outside the gated community about 1.5 miles south. Lucy’s owner was able to spot her alongside a very busy country road. Lucy looked right at her mom and turned and ran. It was at this point she realized Lucy would probably need to be humanely trapped, something she was concerned about and hesitant to do. The days went on with a sighting a day… she was in someone’s garage… she was sitting on someone’s front stoop…When she was in an area, we’d try to get her to stay with a feeding station monitored by a camera but Lucy wasn’t ready to set up a “safe space” yet. Her owner and good friend continued to flyer around sightings so we wouldn’t lose track of Lucy’s travels. More rain and more cool weather but still no Lucy. Another call came in; this sighting was in Lucy’s small neighborhood, 2.5 miles from where she was lost, and just four houses from her home. 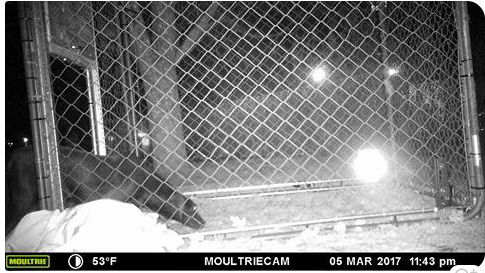 Again with the camera and feeding station with an additional feeding station set up at her house. No Lucy. Then another call from a few houses over. Lucy was running around and under the decking of the neighboring house, a log cabin. There were a lot of hiding spots in this neighborhood. We were hoping she had set up a “safe space”. We set up the camera and food station again and caught her on camera the next day! We moved a trap in… no go. Then the weather turned bad again. Rain and rain and rain with freezing temps. At this point Lucy had been lost for almost 2 weeks. Residents were skeptical she was still alive, saying there are coyotes and hawks. I told them, you’d be surprised. 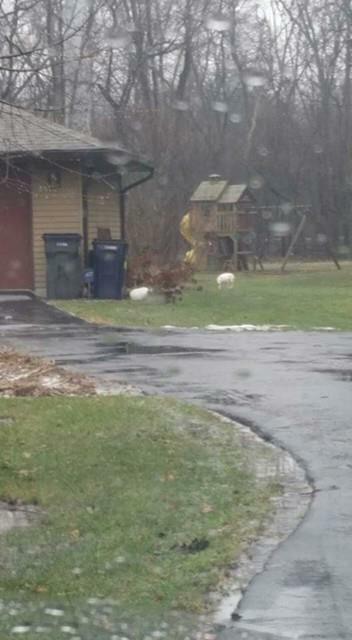 With the cold weather setting in, out of concern, Lucy’s Mom sat in the rain from a distance while she called Lucy calmly. She could see under a lot of the decking and nope, no Lucy. This morning we baited and set the trap again…some yummy hot and steamy ribs and fried chicken! 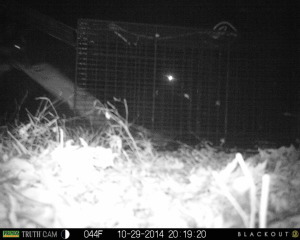 Within an hour we had Lucy on camera at the trap and within seconds, she had tripped it!!! When her owner and I showed up to take her out of the trap (in a contained enclosed area), Lucy didn’t recognize her Mom at first and growled and showed her teeth. This is typical with a dog that’s been pushed into survival mode. Within a few minutes though, Lucy was wagging her tail and ready to get out! After seeing the vet this afternoon, Lucy was given the all clear. She is dehydrated and needs to put some weight on but is pretty healthy overall after her nearly two week ordeal, proving that dogs are resourceful and survivors. Great job Erika, Connie, Laura and everyone else that assisted with flyers, support and positive thoughts! 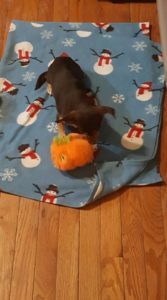 Another lost dog is back home to safety! Thank you, Stephanie, for sharing Lucy’s story. This entry was posted in Reunions and tagged feeding stations, lost dogs, reunion stories, reunions, shy and timid dogs, Trapping on April 7, 2017 by Susan. 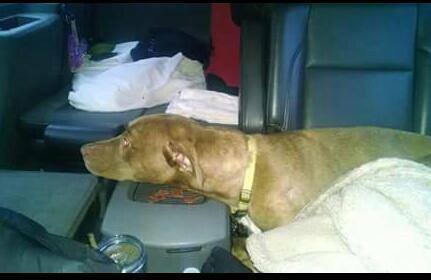 Last February, Ace was being transported from Oklahoma to his new home in Wisconsin. Ace’s family met the transporter at the Petro gas station in Rochelle off Illinois-39. Ace backed out of his collar and escaped. Below is the map of Ace’s sightings. 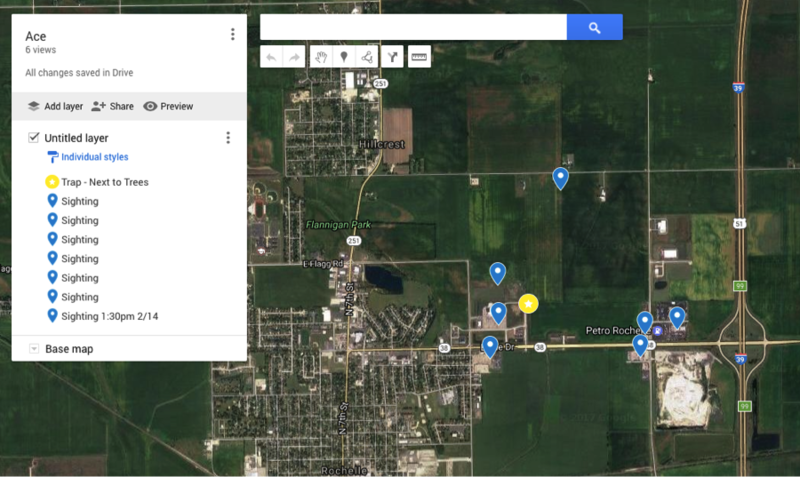 You will note that Ace stayed in close proximity of where he went missing (Petro station just left of the cloverleaf). Residents were told to let Ace settle in the area, keep a feeding station going and soon a trap was set up (yellow marker). Ace was caught almost immediately after the trap was set up. It was a Safe and Happy Reunion! Click here to read more about Tips for Dogs that are lost other than home. This entry was posted in Reunions and tagged feeding stations, flyers, reunion stories, reunions, settle in the area, Trapping on April 6, 2017 by Susan. Juno was out loose for 15 days. 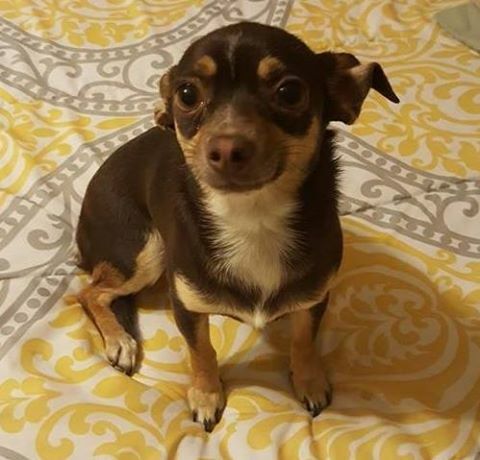 She was a shy pup who had been adopted in November. 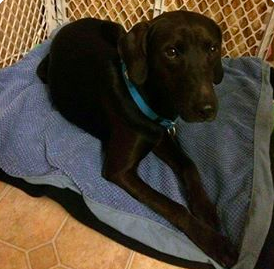 She got loose from her collar from a Petsmart in Schaumburg and any effort to get close to her did not work. This area of the western suburb was very busy with traffic, businesses and restaurants and close to the expressways. It was a dangerous area for her to be lost in because she could have easily darted into traffic and been hit. The owners lived some distance from the area where she got loose and for the first week did not really know how to proceed. 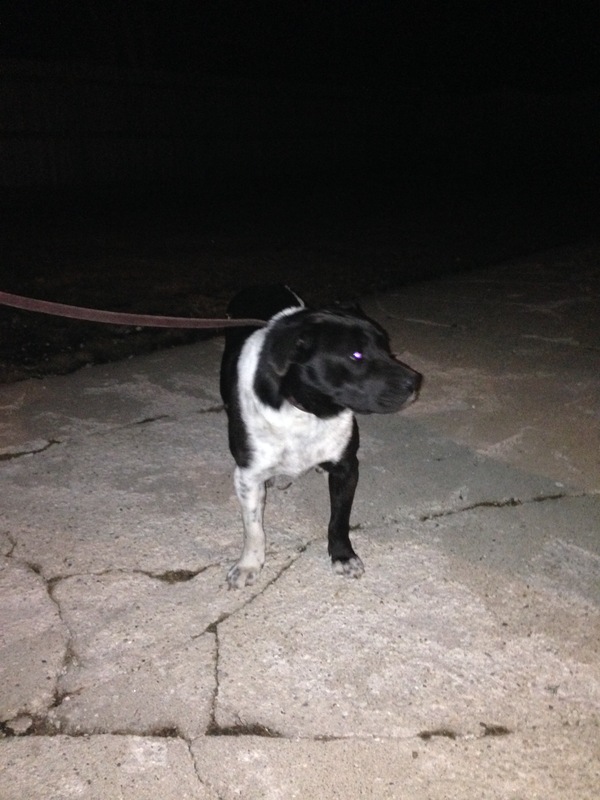 A few calls had been made to the local police of sightings but the owners thought animal control would catch Juno. They reached out to the previous foster who reached out for help. A week later flyering was started and a pattern began to emerge. Juno had settled near a brewery, Ikea and some brush and water. A feeding station and cameras were used to help determine better times when Juno would emerge and show herself. Employees saw her and called and were gently reminded to not chase Juno or feed her because a plan of action was in place to capture her safely. A humane trap was set up with food for Juno. She was initially interested and realized the food was near. She ate some, circled some, left and came back and tested her surroundings even though she knew the noises, the cars and her routine. She would stick her head in and out. Juno was always alert and would also stretch her legs far out even when engaging the trap. After some time, it seemed she was so close but the door bounced down and Juno spooked! She ran away and did not come back that night or the next day. We kept the feeding station with a trap set and watched but Juno wanted nothing to do with it. Flyering continued. It was decided to just keep the cameras out and food available without the trap, to give Juno more time to feel comfortable and eat. It worked. She came back several times day/night. 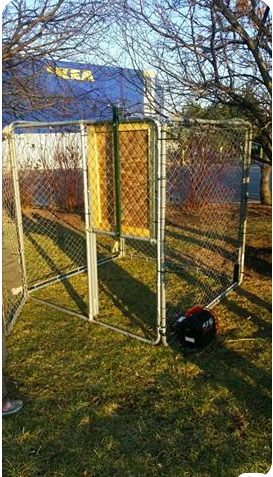 Susan from Lost Dogs Illinois donated their outdoor kennel which her husband had refurbished to make a trap with a guillotine door. 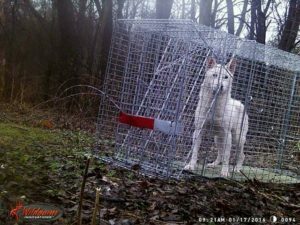 These traps are sometimes used for scared skittish pups and or for pups that may have spooked from conventional humane traps). 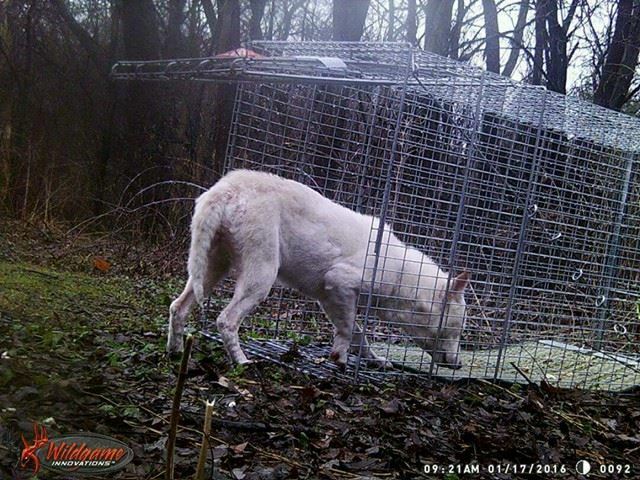 Because the traps are large and harder to transport, there use takes time and planning. Two volunteers, Frank and Tom worked on the trap and added a laser trip function, which runs on a battery charger and 120lb magnetic door. We were able to transport this to the area where Juno was feeding. We assembled it and got cameras up to monitor Juno’s behavior. 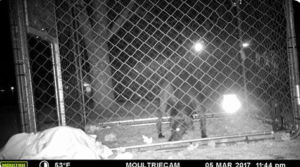 Everyone volunteered their time to monitor the cameras and trap. We never leave a trap set and unattended for safety. After the trap was set up, it took Juno a full two days to get used to it. (This could go quick or for some dogs takes days, weeks or longer of slowly moving food inside). On night one Juno was very aware the food was in and around the trap. She did her dance around the trap and left and came for approximately 5 hours, then left until the following evening. When she returned, she did alot of the same back and forth. But, all kinds of good food eventually overcame her fear and and she safely entered the trap. Gotcha! Even though Juno got loose from an unfamiliar area she still stuck fairly close ( within a 2 to 3 mile area). Flyers generated calls about sightings, cameras helped track a pattern and feeding stations kept Juno coming back. 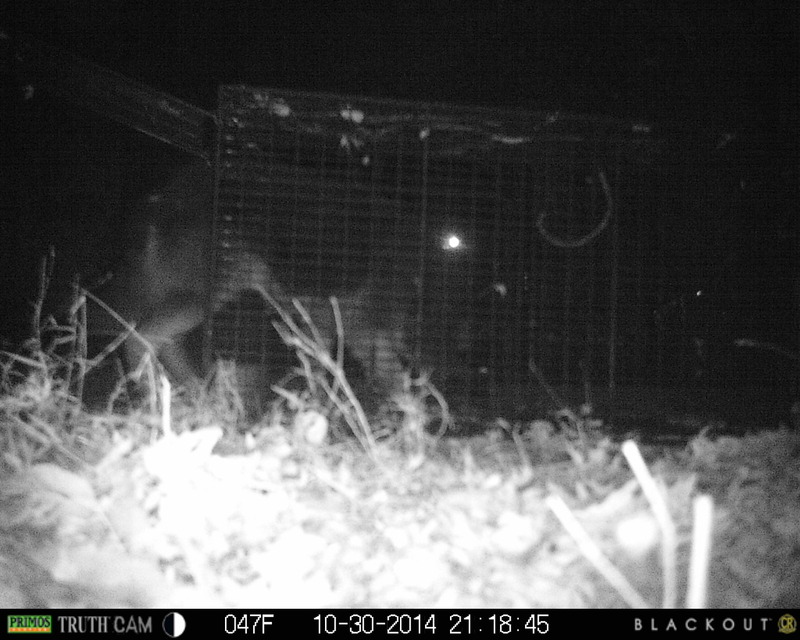 The patience of using the right trapping procedure paid off. This sweet pup was off the street! Thank you, Rosanne, for sharing Juno’s story! This entry was posted in Reunions and tagged dog traps, feeding stations, Good Samaritans, Live human traps, lost dogs, lost other somewhere other than home, reunions, sightings, smelly food, smelly treats, trail cameras, Trapping on March 23, 2017 by Susan. Leia being sighted in a backyard. Speak with callers and get better details. Leia was seen several times in yards where flyers had been given to homeowners. Guess what? They called. 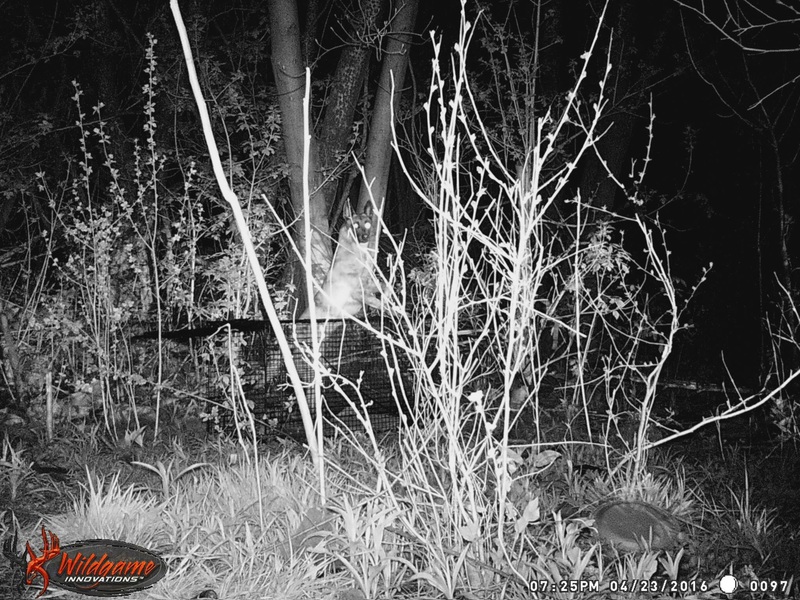 We established a good area for a feeding station and camera and trap. All the meanwhile still flyering. Learned and saw for our own eyes Leia in the area and actually engaging the zip tied trap baited with irrestable food. We knew she was comfortable and…. Set and watched the trap. Leia checking out the trap! To say this went like clockwork is true. Flyers generated sightings. Sightings told us areas where she was. Homeowners were willing to allow us to use the tools we needed. Finally, patience and observation helped us capture Leia safely. Thank you, Rosanne, for sharing Leia’s story. This entry was posted in Feeding Station, lost dogs, Rescues and Shelters, Reunions, Shy Lost Dog Strategies, Sightings, Trapping, Uncategorized and tagged lost dogs, reunion stories, shy and timid dogs, sightings, Trapping on January 20, 2017 by Susan. Susan Hochgraber was so thrilled to see her Belgian Malinois again after 11 days that she almost didn’t mind the “guests” Rosie brought home with her. Hochgraber, a canine massage therapist from Midlothian, Ill., had barely had time to get to know the dog she rescued January 15, 2016 before Rosie escaped on April 12. Hochgraber had noticed that Rosie was beginning to jump at fences, so she instructed her dog walker to take off Rosie’s leash only after she had gotten the dog into the house. But the dog walker unleashed Rosie in the yard that day. Rosie promptly jumped Hochgraber’s 4-ft.-high fence into a neighbor’s yard, and then double-jumped the neighbor’s gate fence into the street. She was gone in a flash. 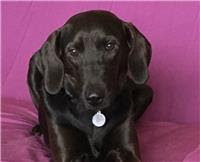 Hochgraber turned to Lost Dogs Illinois, FindFido’s service, Facebook, friends and neighbors, police departments in surrounding suburbs, and Perfect Pooches, a Chicago-area dog rescue and adoption agency, for advice on getting Rosie back. 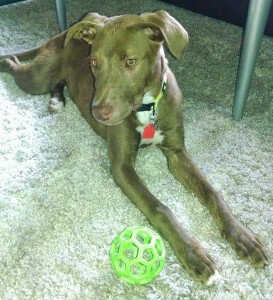 People also reported seeing Rosie along the Metra railroad tracks that run between Midlothian and Robbins. Rosie apparently followed those tracks down to Robbins, where a woman named Charita lives with her family. Hochgraber called out to her dog, which got Rosie’s attention; but when she made a move towards her, the dog bolted in the opposite direction. 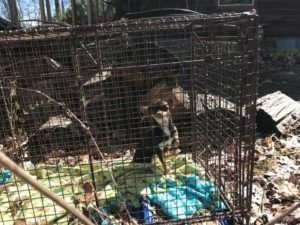 Volunteers from Perfect Pooches helped Hochgraber set up humane traps and round-the-clock surveillance in Charita’s backyard and near an abandoned house next to her home. They figured it might be Rosie’s “quiet place,” where she went for the night. Hochgraber placed Rosie’s blankets in the traps, as well as towels that had the scent of her other dog, a German Shepherd named Buddy. The volunteers baited the traps with some of Rosie’s toys and treats like hot dogs and BBQ chicken from KFC. The first night, Rosie managed to get the food and even lie on a blanket left inside the trap without tripping the door. The next night, she lay down next to the trap. The third night, April 23, Rosie lay down inside the trap. stretched out, and tripped the gate door shut. The volunteer on duty waited five minutes to make sure Rosie was inside before calling Hochgraber with the good news. Hochgraber said she plans to replace her 4-ft. fence with a 6-footer. She put a GPS collar with a tracker on Rosie, “and she is always on leash now when she goes out,” Hochgraber said. She added that the people who follow the LDI Facebook page were nothing short of “amazing” with all their reports of sightings and notes of encouragement. “Their support helped me get through 11 days of hell,” Hochgraber said. 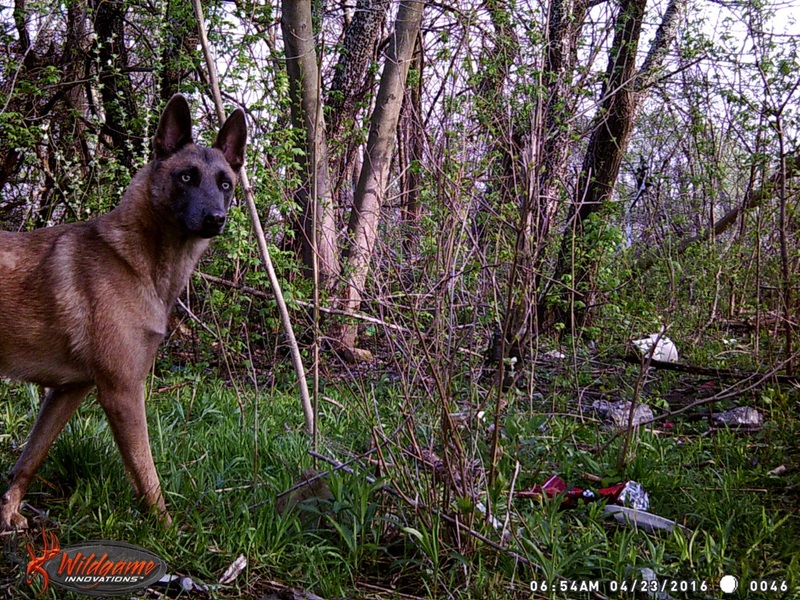 This entry was posted in Reunions, Shy Lost Dog Strategies, Trapping and tagged dogs, lost dogs, Lost Dogs Illinois, reunion stories, shy and timid dogs, shy dogs, smelly treats, trail cameras, Trapping on May 9, 2016 by Susan. Bella, Bella Where are you? At 7am Thursday, I received the call we had been waiting for, “Your dog is at the end of our driveway, but headed North when I opened the garage.” “I live on Bordeaux & I have one of your flyers. It’s her. She looks good other than being thin.” said Marie. Off we went armed with heavy treats and for once, HOPE. I knew in my heart of hearts (and my gut) she was still in the area. Marie’s house was actually the house she was last seen at on Friday night by the neighbor (and our new BFF), Bob. We were told not to be excited & shouting her name because she’s scared. Danny dropped me where she ran off to with Lilly (our other dog) and he went to scour the other neighborhood just North. The plan started. We called some folks at Foster2Home & also a woman named, Vicky, who gave us advice. We could finally make the call we were waiting for to safely trap her. We called Lake County Animal Care to rent a humane trap. I went home to get stinky food, her bowl, a lawn chair and some other things for a stake-out. Our girl was here & I wasn’t leaving till we had her. I set up a mini safety zone for her while I waited for Danny to get the trap. I was at the end of Bob’s property with food, blankets, my clothes (for scent) and of course, Lilly’s markings. She would cry as we walked around the area confirming Bella was close and had been there. I sat at the neighbors house waiting….no sightings. That was finally okay though, because she WAS there….6 days later. We decide to set up the trap at Marie’s house since she, as we found out by her son, was comfortable showing herself there. He saw her Sunday night there as well. I ran home to get even stinkier food, food for me, clothes, blankets, towels, Lilly, my computer, and even toilet paper. Yes, I was staying a while and wasn’t going to miss her! I parked my car at the neighbor’s half drive facing the trap and low and behold, l locked my keys in the car with Lilly AND my phone. I ran to Bob’s house to call & have Sandy get the second keys. She said she would, but needed to finish something first. So I decided to walk the field just West across the street that had no entrance. That was interesting to get through & added to the already outdoorsy smell I had going. I walked the entire field clicking her leash, using her squeaky toy, very calmly & quietly saying her name. I also waved bacon as it was windy. She was around, I could feel her. She could hear me, I just knew. I went back to car to get the keys (yes, thank you Sandy) and set up my stakeout. We settled in, Lilly resting in her kennel and me popping open my computer and doing work. I figured it would be dusk before she’d come out. Boy was I wrong, an hour later something catches my right eye, I turn and there’s our Bella boo walking up the drive towards the car. OMG, OMG, OMG is what I felt and then thought, stay calm, grab food, a leash and be quiet. I got out leaving the door open and didn’t see her, so I started throwing food and quietly saying her name…and then the miracle happened, she POKED me with her nose from behind. I swung around and there she stood, tail wagging, eyes red and with a look like ” I’m freaking ready to go mom. You can leash me and I’ ll lead the way.” I am not sure how many times I said OMG in the next 30 seconds….I was shaking. She jumped in the front under the steering wheel and curled up on the pedals and looked at me like, let’s go. All I could think was, did this really happen and was it that easy???? The answer was YES. We had our girl back and I was taking her home. Finally after 6 of the longest days of my life. I am ready to go home, Mom! #2, ALL of YOU. Without you, I would’ve cracked and who knows if I’d be as persistent. The Facebook community is unreal how quickly things can get out and the love and support that comes with it. #3, a FLYER and some amazing people who grabbed on to this story and wanted to see her home. You all could imagine what we were going through and wanted her back, too! And #4, BELLA and HER instincts! She was done with her adventure, smelled me out and found her way to me with that sweet face. I’m still in disbelief AND I am now whole again. I cannot thank you ALL enough for your love and support. We are overwhelmed by this whole experience. Bella and Lilly together finally! 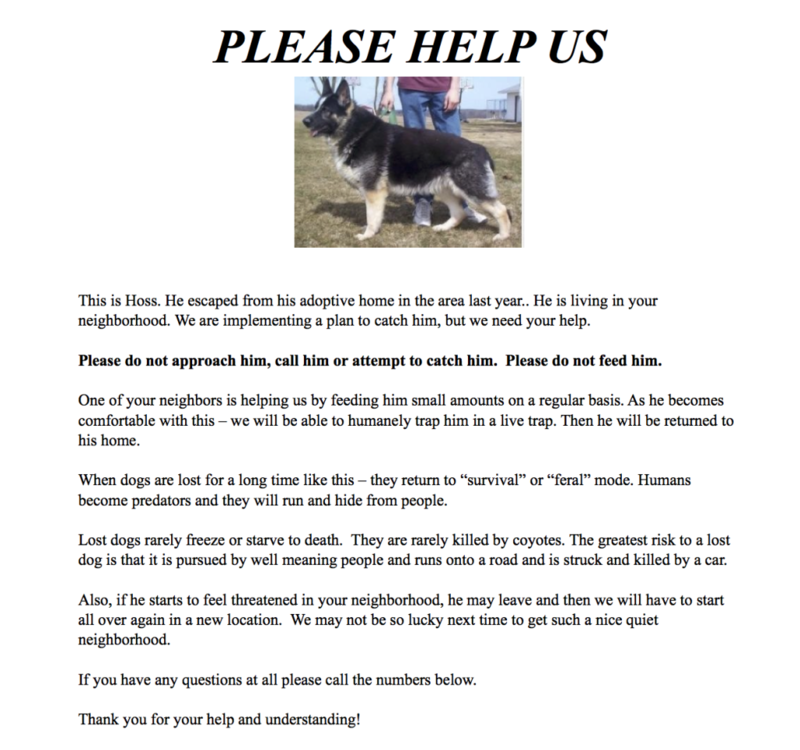 This entry was posted in lost dogs, Reunions, Trapping and tagged animal control, feeding stations, flyers, Lost Dogs Illinois, reunion stories, shy and timid dogs, shy dogs, smelly treats, Trapping on December 6, 2015 by Susan. Reva enjoying her first dinner after being reunited. ‘Reva is safe! She was brought to her new home on Friday, September 4th. Since getting there, her owner has walked the same route with her daily. Because Reva came from a feral/skittish lifestyle, she took the opportunity to bolt when a door was opened. Her harness broke in a freak accident and she took off. For the next 8 hours, she was spotted looping the subdivision her house is in and the golf course behind it. Reva knew what way Dan walked her only after 3 short days. Routine is essential with a new dog, especially a timid one. Smart cookie. Dan and Denise quickly called the local police station as well as animal control. 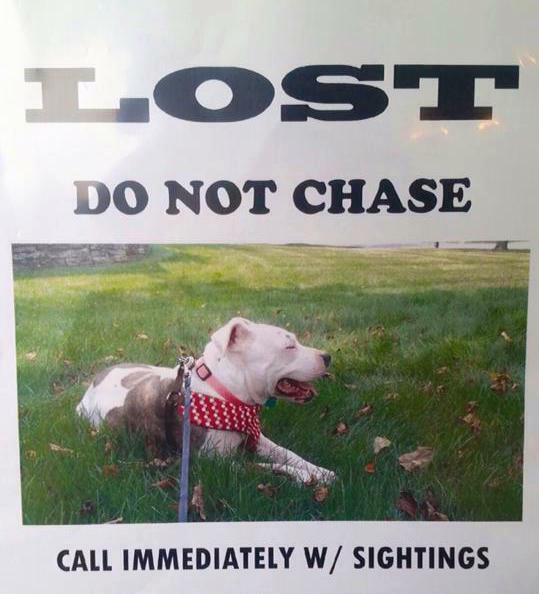 Flyers and posters went up, neighbors were asked not to chase her, but to call immediately with sightings. Reva came to the front and back of her new home 2 or 3 times. Her bed, fresh water and food were placed behind the house. We really believe not being chased kept her safe and in the area. As nightfall came, there weren’t any sightings of Reva for over 5 hours. A humane trap was set and baited behind the house next to her bed and Dan set watch. 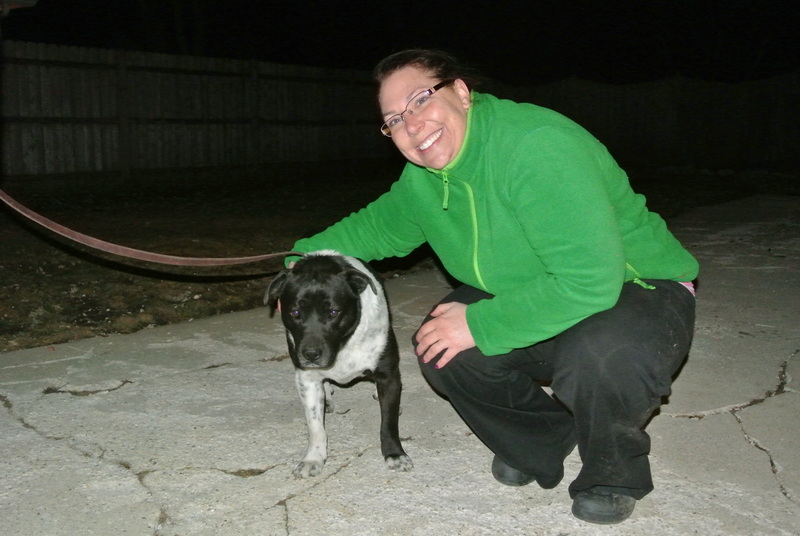 And then, an amazing phone call took place: Reva was in someone’s fenced in yard! The homeowners saw her, called Darien PD (which had Dan’s contact info and description of Reva) and Dan was able to pick her up from the house. Accidents happen. Harnesses and leashes may break when you least expect it. We followed the advice our friends at LDI stress: do not chase and get the word out immediately. Because authorities were contacted, flyers stressing not to chase were posted and the neighbors didn’t disrupt Reva’s loop pattern, she is safe. Never underestimate the intelligence of a dog. Reva was able to retain her walking route only after a few short days, which is critical for a shy dog. Thank you, Katie Campbell, for sharing Reva’s story! This entry was posted in Reunions, Shy Lost Dog Strategies and tagged feeding stations, Friendly lost dogs, lost dogs, reunion stories, Trapping on September 8, 2015 by Susan. Pebbles and the Good Samaritans who did not give up! On an early January evening, while cooking dinner, one of my dogs started barking like crazy at our front door. I went to see why she was barking, and saw a black & white dog in the driveway across the street. I immediately went out and tried to call her, but she just looked at me, went up the driveway and was gone. I rang my neighbor’s doorbell and told them about her. They informed me that they had been seeing her for a couple of weeks. I called Animal Control because I thought it might be someone’s dog from our neighborhood. When the Animal Control officer arrived they did a “drive-by”, didn’t see her, and left. I checked Lost Dogs Illinois’ website to see if I could find any similar dogs that had been posted as missing in the previous two weeks with no luck. A couple of days went by without a sighting. That Saturday we decided to walk around the neighborhood to see if we could spot her, and we did! We called Animal Control again. When the officer arrived I gave him a description of the dog. He informed me that they had been looking for the same dog for 6-8 weeks. 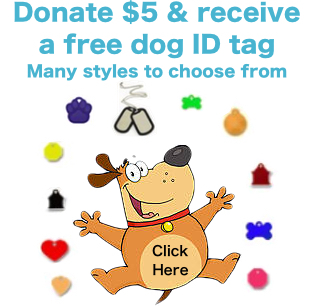 I went back on the Lost Dogs Illinois website to search for missing dogs back to November or December. That is when I saw Pebbles. She had been missing since November 24th from Carpentersville. I wasn’t sure if that was really the dog I was seeing because we live in Elgin. We are about 10 miles from where she was last spotted. Could this really be Pebbles? At first we were unsure if we should contact the person who posted her to LDI’s page. We weren’t positive it was Pebbles, because she wouldn’t let us get close enough to get a good look, but the similarities were uncanny. Our thought was “some hope is better than no hope” so we got in contact with Rayann, Pebbles’ foster mom. 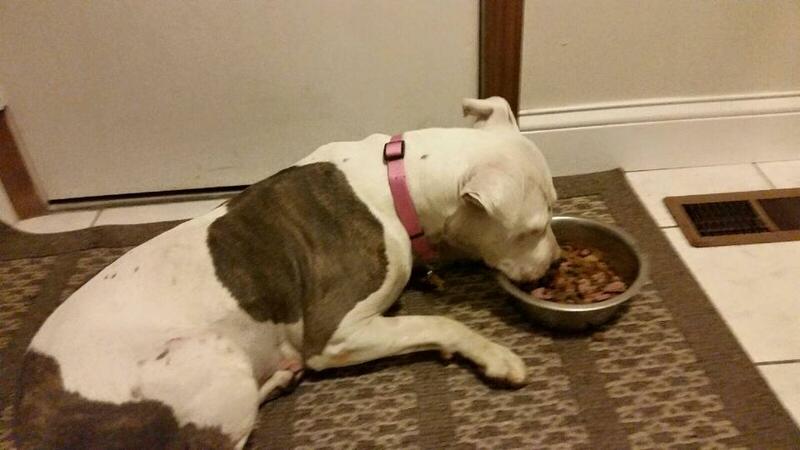 She informed us that Pebbles had gotten out while on a trial adoption with a family in Carpentersville. Rayann and another woman came out the next night to help us search for her. We had no luck that night, but told Rayann we would not stop trying and would text her if we spotted Pebbles again. Steve spent countless hours tracking and searching the neighborhood. He was out there in a blizzard, and on many below-zero nights, hoping to find signs of where she was sheltering. He had a few leads, but never truly found her it. Pebbles did lead him on a couple of nice long walks around the neighborhood as she darted in between houses and through yards. We then set up a feeding station at our house, handed out flyers, and knocked on peoples’ doors to generate sightings. It turned out that a lot of people had seen Pebbles. 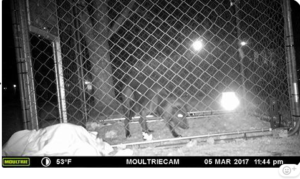 We installed video cameras at our house so we could watch and record when the dog was coming to eat. The first time we got her on video, I sent it to Rayann, and she confirmed it was in fact Pebbles! At that point, we weren’t sure how we were going to catch her. That’s when I saw a post on LDI’s Facebook page about a dog that had been missing for a year and was recently caught. I commented on the post saying how it gave us hope about catching Pebbles. Susan Taney and Katie Campbell replied to my comment and from there we started messaging on Facebook. Susan informed me that she had a trap we could borrow. The next night, Susan drove out to our house and showed us how to set the trap and explained how to lure Pebbles into it. We spent two weeks slowly moving the feeding station into the trap. Then, at 3:59am on February 22nd Pebbles worked up the nerve to go all the way into the trap. She set off the trap but, unfortunately, the trap door bounced and she was able to get out. Our hearts were broken. The next day we started the process of slowly moving the feeding station into the trap again. Pebbles was now so leery of the trap that she wouldn’t go anywhere near it. It was time to devise a new plan. After consulting with Susan and Katie, we decided it would be best to try and get her into our backyard. My husband, Steve, is very handy and extremely talented when it comes to thinking outside the box and putting those ideas into motion. He thought that if we could get her into our backyard and figure out a way to get the gate to close behind her, we could catch her. He rigged up a whole pulley system with ropes and bungee cords tied to our gate, with the other end of the rope tied to a frozen hot dog. Pebbles had a history of taking the food we left out for her and running off with it to eat somewhere else. If she tried to take the hot dog and run she would set off the trap, and the gate door would close behind her before she could get out. Once again, Pebbles outsmarted us. She came into our back yard several times, but each time decided to lie down and enjoy her hot dogs in peace. Again, it was time to figure out a new plan. Steve made some adjustments to his design, and decided that he was going to attach a rope to the gate and bring it up to the front porch of our house. 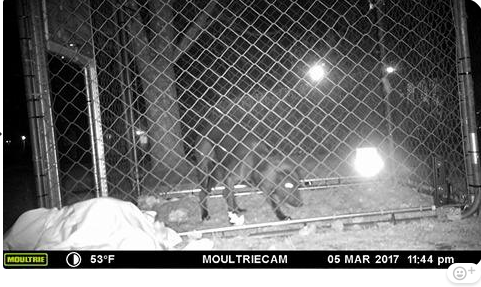 We were hopeful that when we saw her on the camera in the backyard, we could go out front and pull the rope to close the gate. We tried this every night for about a week, but Pebbles would never come when we were awake. She somehow knew exactly when we went to bed and would show up about 10 minutes later. We nicknamed her “Santa” because she “knew when we were sleeping and when we were awake”. She would then wander around our yard and peacefully eat her hot dogs. Finally, on March 17th , Steve decided he was going to stay up late to see if she would come. It was around midnight when he saw her on the camera. Her head popped through the open gate and she looked around. She then came all the way into the yard and started sniffing around. Steve immediately went out our front door and pulled the rope with all his might to shut the gate. The gate was closed and she was now in our back yard! I was awakened when he said “I got her…she’s in the back yard!” I instantly called Rayann to tell her the news. She was so excited that she got dressed and headed out our way. Now we had to try to get the slip lead on her, and it wasn’t going to be easy. 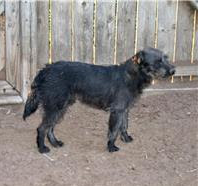 Pebbles is extremely fearful of people…even those whom she had been seeing and smelling, and who were feeding her daily. I messaged Katie and Susan for advice. Katie suggested one of us go out there with food, sit down, and slowly scooch our way toward Pebbles. I armed myself with a bowl of cut up hot dogs and headed to the backyard. I sat down and had Pebbles in my sight, never making direct eye contact with her. I used yawning and lip licking as calming signals, while pretending to eat the hot dog pieces and gently tossing some to her. Every couple of minutes I would scooch a little closer and she would move away a little more. After about an hour and a half I was able to get her in the corner behind our garage and shed. She let me get close enough that I could softly pet her and tell her it was going to be ok. I pulled the slip lead out of my pocket and gently slid it over her head. She never resisted. She knew her ordeal was over and she was safe. I called Steve to let him know that he and Rayann could come outside. Rayann was so happy to see Pebbles, and Pebbles was happy to see her too! We were all in tears. On March 18th at 2:00am, after three months, several failed attempts, a blizzard, below zero temperatures, accidentally trapping a raccoon, and overwhelming concern for her safety, Pebbles was finally safe! Pebbles is now in her forever home with Rayann (who is going to adopt her!) and all of her doggie siblings. She got a bath, a new collar and tags, and is proudly strutting around showing everyone. A very happy ending to a long adventure for everyone! Pebbles and Rayann — Home At Last! Thank you Amy for sharing your story! You and Steve rock as Good Samaritans! This entry was posted in Feeding Station, Reunions, Trapping and tagged feeding stations, lost dogs, reunion stories, shy and timid dogs, shy dogs, Trapping on March 21, 2015 by Susan. 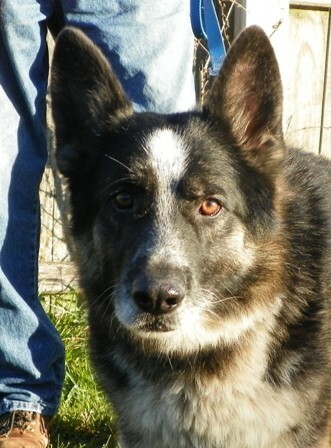 This is a true survivor’s tale – a story about a dog named Mitch, a Border Collie Mix who slipped out of his collar and went missing on 1/20/14 just two weeks after being adopted by a new family. 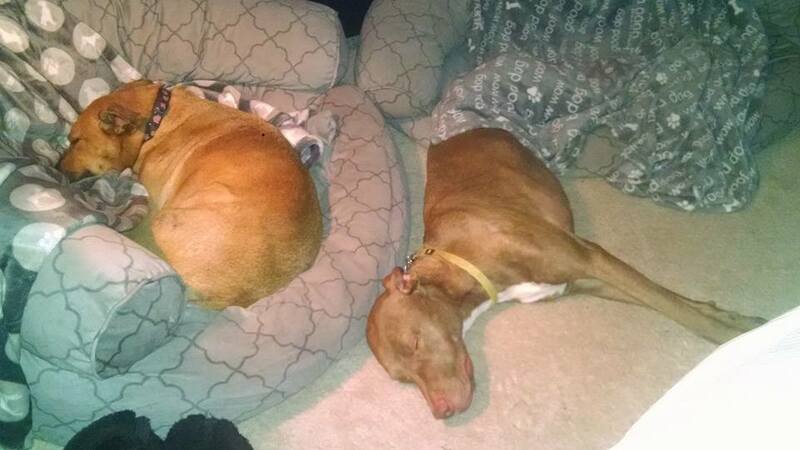 Immediately after he got loose on that cold winter’s day, his family posted him on Lost Dogs Illinois. As the weeks went by, they responded to each sighting, started a Facebook page dedicated to finding him, and never gave up hope. Little did they know that Mitch had been traveling from Burr Ridge to Countryside, surviving on his own for 6 months. During that time, neighbors were feeding him, the vet clinic was trying to lure him in, and the police were trying to catch him, but Mitch was in survival mode and evaded everyone. And then, out of the blue, over a year since he’d been lost, a jogger contacted the staff at the Barker Shop in La Grange about this dog he kept seeing. The shop posted the sighting on their Facebook page, and other people started posting that they too had seen this dog! The Barker Shop Rescue Team went into action; set up a feeding station and then a humane trap, which they placed in the snow. Mitch entered the trap right away but the door got caught in the snow and wouldn’t close. They then moved the trap to an intersection, as Mitch watched their every move. Once the rescue team returned to their cars, Mitch started sniffing around and got into the trap. Success! 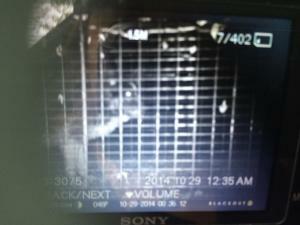 He was taken, inside the trap, to the vet clinic, where he was scanned for a microchip. Once the chip information came up on the scanner, Mitch’s owners were called and there was a very, very happy reunion. Smart, brave, resourceful Mitch had survived the Polar Vortex and the Blizzard of 2015. He did not starve, nor was he killed by coyotes. Missing 1/20/14, Reunited 2/08/15. 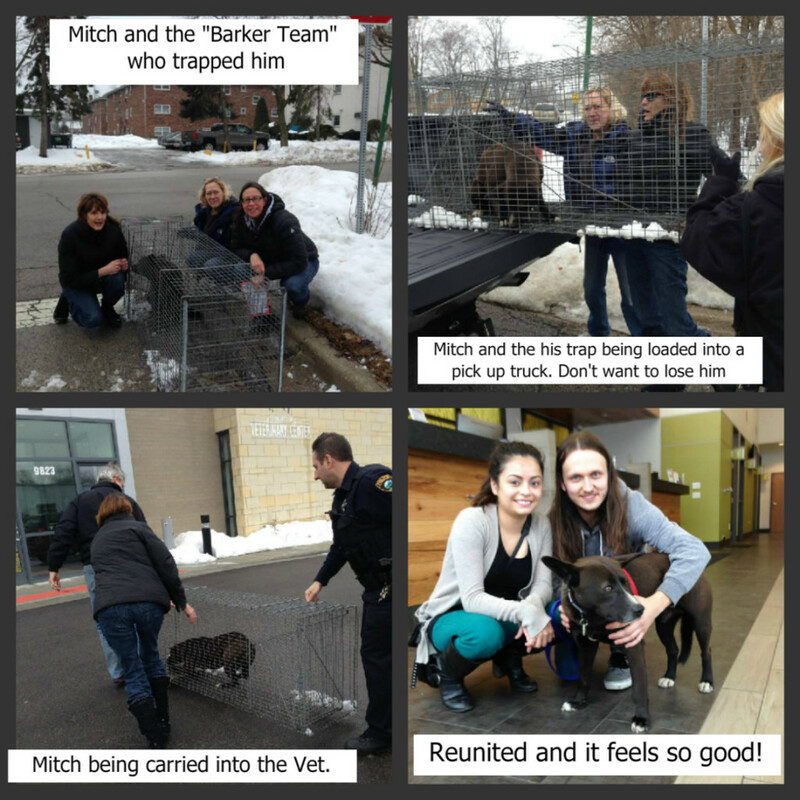 Welcome Home…at last, Mitch! This entry was posted in Reunions and tagged 2015 Blizzard, microchip, Polar Votex, Trapping on February 13, 2015 by Susan. On May 31, 2013, Dawn and Roger from Michigan received a phone call saying Hoss, who just had been adopted out, had gone missing and had been missing for a week. Immediately Dawn submitted a Lost Dogs Illinois lost dog report. Days, weeks and months passed but they never gave up hope. Now fast forward to two weeks ago to the North Shore Posse Team (dedicated to finding Holly, the German Shepherd from Wilmette, who went missing in July 2013), which received a sighting of a German Shepherd fitting Holly’s description. They sprung into action; flyered the area and got more sightings. They then set up a trail camera in the area where she has been known to frequent. The camera did show a German shepherd but it was not Holly. Lea, one of the volunteers, decided to check the Lost Dogs Illinois dog database to see if there were any GSDs fitting the dog on the camera. She found Hoss and posted the picture to the group. 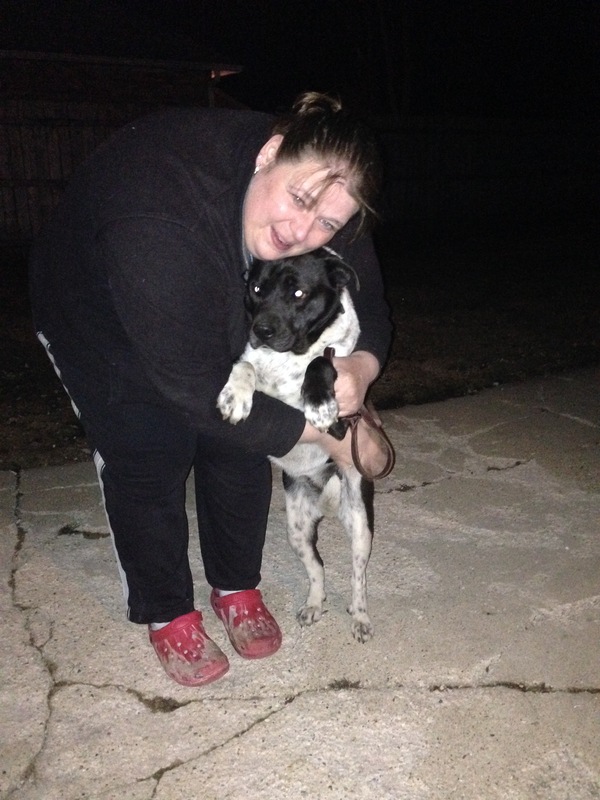 Also Hoss had gone missing only 5.5 miles where he was now found. They were pretty sure it was Hoss so they contacted Dawn and Roger who confirmed this was their dog. Roger and Dawn then came down the next weekend and camped out with their other dog. 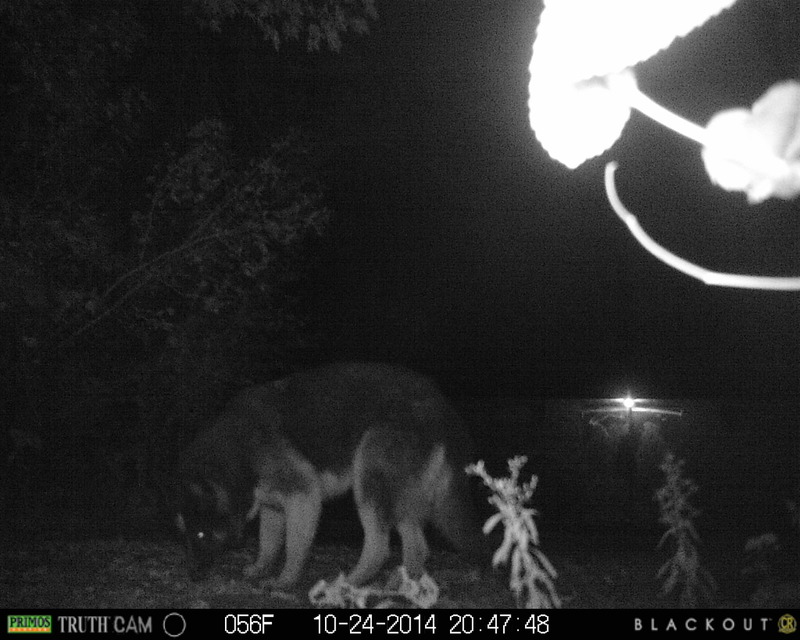 Hoss would not approach but the trail camera would catch him after they left. Disappointed Roger and Dawn left for Michigan. The North Shore Posse group continued to keep the feeding station going and distributed the following letter to explain what was needed to be done by the neighborhood. Cakes and Katie said they would continue to monitor the feeding station and set up the humane trap. They bungeed cord both doors up so Hoss could just walk through the trap to get use to it. Then proceeded to put one door down and leave one door bungeed cord up. Within a couple days going back to Michigan, Roger came back down to watch the trap. During those nights, Roger witnessed Hoss dragging the blanket out of trap. He was stealing food from the trap. He was just not ready to be trapped. During this time, Roger was improvising his own trap. Watching the you tube video of Misty’s trap, he put together his own trap for Hoss. So that night, the humane trap was set and so was Roger’s trap. Early the next morning, Hoss was trapped in Roger’s trap. Roger called Cakes and Katie to have them help him remove Hoss from the trap. Hoss had only lost 10 lbs thanks to a neighborhood where individuals were throwing out food to him which in turn became his own safe turf. – Dogs are survivors! Hoss had been living in this neighborhood even during the polar vortex. 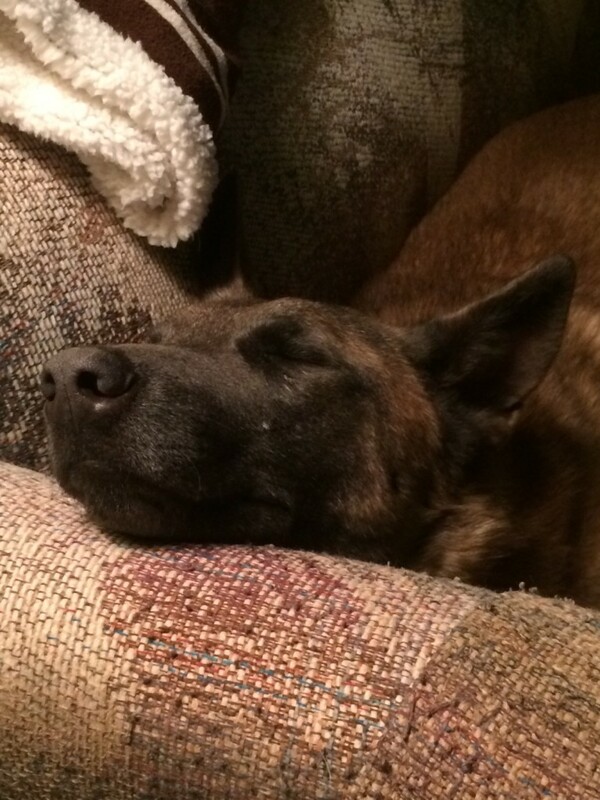 He was mostly a nocturnal dog so most people thought he was a coydog. Hoss’s feeding station and trap was setup at a spot he frequented because he would eat the bread a woman threw out for the raccoons. 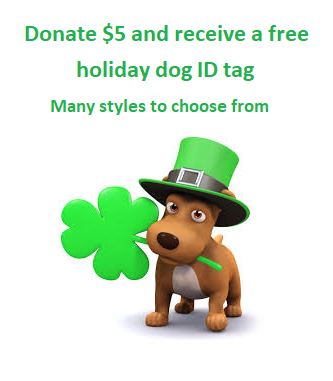 – Remember not all lost dogs are homeless! If you see a “lost” dog, be sure to check LDI’s website and search their dog database, call your local animal control or shelter to see if anyone has filed a lost dog report. – Once this dog was sighted, a plan was made and it was followed. Hoss has established his turf and the team worked with him. They didn’t push him; they just let him be. Simply fed him the same time in the same place every single day. – AND Never Give Up! Roger wants to thank the neighborhood where Hoss had settled in. The neighborhood rallied around Hoss and Roger. They fed Roger knowing he was monitoring the trap at night. They also let him borrow their tools to build Hoss’s second trap. 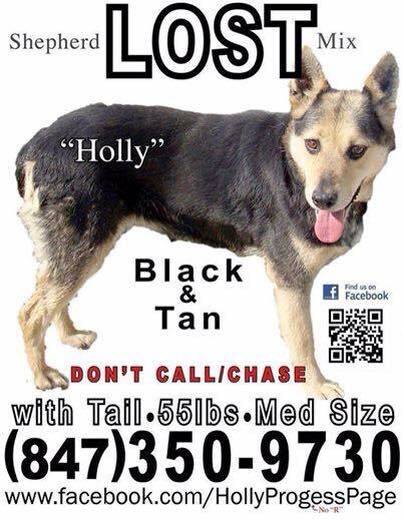 Thank you to the North Shore Posse team for not giving up on Holly and making this a team effort to capture Hoss. Thank you, Katie, for leading the team! This entry was posted in Reunions and tagged trail cameras, Trapping on November 1, 2014 by Susan.